Mele Fong teaches “Broadway Show Tunes” as part of the Sing-Along with Mele Fong series on Maui. 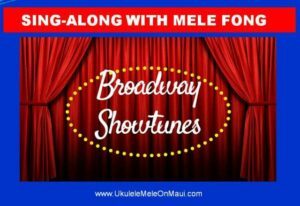 BROADWAY SHOW TUNES is one of the new themes for my Sing-Along with Mele Fong series next year at Kaunoa Senior Center for adults 55 and better on Maui. We spent Wednesday-Sunday, August 22-26, selecting, arranging, and audio recording eleven songs to teach next year. Since we were sequestered indoors (all classes cancelled) because of Hurricane Lane that was expected to hit the Hawaiian Islands as a category 5 hurricane, we decided to do what we enjoy most – sing and play music on our ukulele and u-bass. Luckily we did not have any damage to our property on Maui – just a lot of rain. Do-Re-Mi – G – 9 chords – Latin Strum. Getting To Know You – E – 4 chords – I Wanna Rest Strum. Give My Regards to Broadway – C-8 chords – Bossa Nova Strum. I Could Have Danced All Night – F- 13 chords – Latin Strum. I Whistle A Happy Tune – F – 6 chords – Hum Ding-Ah Strum. Moon River – F – 13 chords – 2 Waltz Strums. My Blue Heaven – F-10 chords – I Wanna Rest/4 And Strums. Oh What A Beautiful Morning – F – 9 chords – 2 Waltz Strums. Singing in the Rain – C – 2 chords – Hum Ding-Ah Strum. Sound of Music – C – 12 chords – Pick in 4 Strum. The Surrey With The Fringe On Top – F-12 chords – Hum Ding-Ah Strum. You can learn to play the songs with private webcam lessons from wherever you live. I will email you my song arrangement with unique strum for ‘ukulele and you can listen to the audio recording to play along with it through my website Fan Club. In fact, there are over 100 audio recordings of my song arrangements to choose from categories of Hawaiian, hapa haole, pop, and Christmas songs – FREE!. Are UKE having fun yet? Watch. Listen. Play. The Ukulele Mele Way Today! No one else teaches my method of forming ‘ukulele chords with minimal muscle strain and strumming styles. CHECK OUT THE PRODUCTS AND SERVICES available for beginner, intermediate, and advanced ‘ukulele players.